On Wednesday, May 27, 2015, at about 2:52 PM., Santa Clara Detectives learned Ray McDonald violated a restraining order for being at a residence in Santa Clara. Detectives later located Ray McDonald at a nearby Togo’s Sandwiches, 2203 Tasman Dr. in Santa Clara. 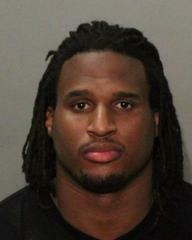 Ray McDonald was arrested without incident and transported to Santa Clara Police Department for processing. He will be booked at Santa Clara County Jail. The restraining order Ray McDonald violated was issued as a result of his earlier domestic violence and child endangerment arrest which occurred in Santa Clara on May 25, 2015. This is an on-going investigation and further information will be released when it is available.